The most common pilot line protection today is directional comparison by use of distance relays. However, the increased availability of digital communications channels has renewed the interest in line differential relaying. Current-only relays have many advantages. One of the most significant advantages is the simplicity of the scheme with regards to settings. The percentage differential principle originally developed for transformer and generator protection was extended for use on short transmission lines already in the 1930s, and is still widely in use. These Pilot Wire Relays typically use a telephone type pilot wire channel to exchange analog information between the line terminals. The electromechanical pilot wire relays were very easy to set. They either came with factory default fixed sensitivity or had a few tap settings. What tap to use was determined by estimated fault current on the line, making sure that the relay sensitivity was sufficient for the relays to dependably trip for all types of fault on the line. Three phase sensitivity was often limited to current above load levels in order not to trip for open pilot wires. For digital current differential line relays, the sound and simple setting principles utilized for pilot wire relays seem to have been forgotten. Commonly, the most sensitive setting (10 – 20 % of nominal current) is applied and even recommended without any consideration of actual fault current levels for the application. This practice contradicts fundamental relaying principles that balance security, sensitivity, dependability and operating speed of the protection scheme. For sensitivity, the requirement is to set the relay to detect all faults on the line with a sufficient margin, seldom does this require the most sensitive setting. Higher sensitivity will increase dependability, but decrease security. 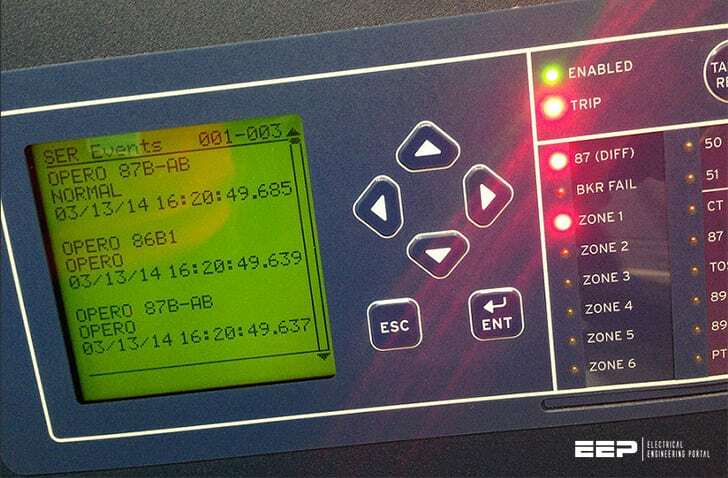 Too high sensitivity may cause false trips due to ct errors at external faults with high fault currents, or even false trips on load for channel delay measurement errors due to unequal transmit and receive delays. This paper reviews the basic setting criteria for current differential line protection, and the charge comparison relay in particular. While setting parameters will differ depending on the type of current differential relay, the setting principles and system conditions to consider remain largely the same. Operating time, sensitivity, dependability and security requirements are examined for typical applications. Considerations for weak feed conditions, ct errors and ct saturation, and charging current are discussed. 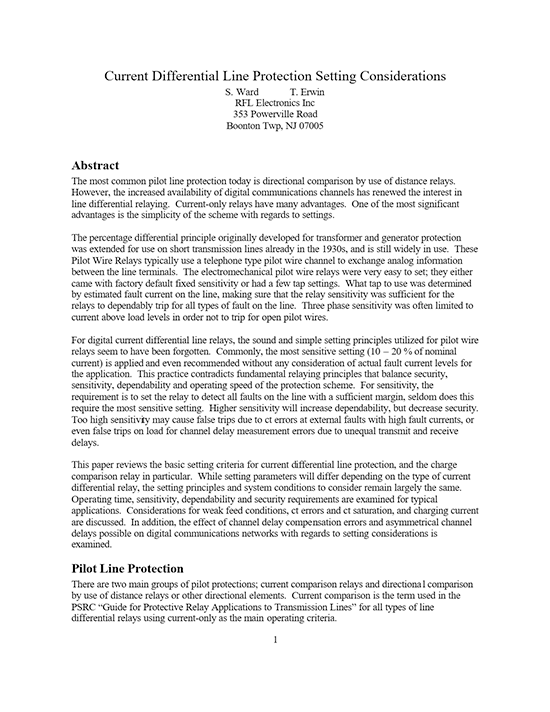 In addition, the effect of channel delay compensation errors and asymmetrical channel delays possible on digital communications networks with regards to setting considerations is examined. Title: Current differential line protection setting considerations – S. Ward and T. Erwin; RFL Electronics Inc.